International child abduction is a crime in every U.S. state and in some cases the abducting parent can be charged with a federal crime under the International Parental Kidnapping Crime Act. Nevertheless, international parental kidnapping continues to happen. The Office of Children’s Issues at the State Department lists on its website measures to help prevent this horrible situation from occurring. It can be a crime even if there is no custody order in place, but obviously having a custody order in place is helpful to prevent an abduction or to facilitate a return of the child is he/she is abducted. No matter how unlikely you think this situation might happen to you, it is important to include a statement that prohibits your child from traveling abroad without your permission or that of the court. Familiarize yourself with the The Hague Convention on the Civil Aspects of International Child Abduction (“the Hague Convention”). The Hague Convention is a treaty between countries that agree to cooperate and abide one set of laws, the Hague Convention, for the return of children removed from their home country for custody disputes. Your custody decree should include the terms of the Hague Convention that apply if there is an abduction or wrongful retention. For information on how to proceed if your child has been abducted to a particular country, please visit the International Parental Child Abduction website. If the other parent is not a U.S. citizen or has significant ties to a foreign country (i.e., family or an overseas vacation home), the American Bar Association also suggests requesting the court to require that parent to post a bond. Not only could this be useful as a deterrent to an abduction, it could be used as your source of funds to help recover your child if he/she is abducted. You also have options regarding the issuance of a passport to your child, according to the Children’s Issues Office. Because the U.S. does not have exit controls on its borders for holders of a valid passport, you must ensure that your consent is needed before a passport is granted to your child. In general, if the child has a valid passport, it can be very difficult to prevent the other parent from removing the child to another country without your permission. If a child is under the age of 16, both parents must consent to the child’s passport application and show proof that they are the legal parents or guardians per U.S. law. If you are still worried that your child may be taken out of the country without your permission after taking the aforementioned measures that you may also ask that the child’s name be entered into the State Department’s Children’s Passport Issuance Alert Program. As the program’s name implies, you or your attorney will be notified if a passport is applied for the child. If you have a court order prohibiting your child from traveling without your permission or the permission of the court, the passport may be denied. However, once a passport has already been issued to the child, the State Department may not then revoke the passport. This is because there are no exit controls for people leaving the U.S. as previously mentioned. So it is vital that you are proactive, not reactive, in ensuring your child does not receive a passport. 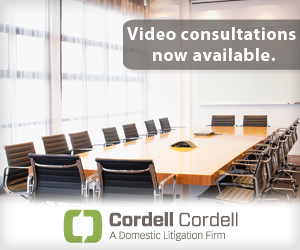 Contact a Cordell & Cordell mens divorce attorney if you need legal representation as most parties in divorce and child custody cases do.